I've been wanting to get a new tattoo for quite a while now and finally got the motivation when this girl I dig was talking about getting a new one. Tattooed together, how romantic. 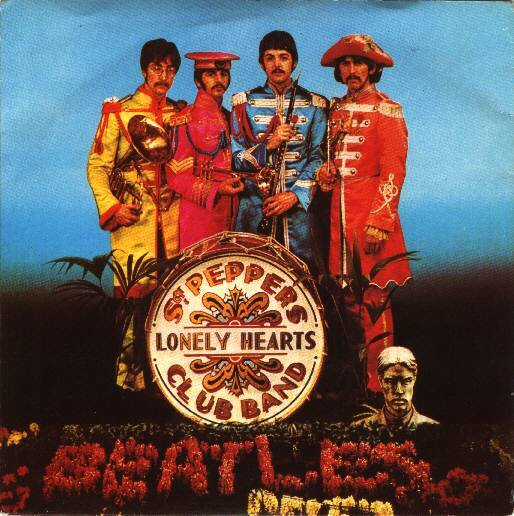 The design I want is the skin off of the bass drum on The Beatles - Sgt. Pepper's album. The problem is I can't find a high-res version of just the drum. I'm hoping someone here can either find a version with just the drum or make one out of the original with photoshop. I'll post pics when I get it done Thanks in advance. You mean this? How hi-res are you looking for? That's close, but I want an exact match to the original. The font & shadowing on that version look different to me compared to the original. A tattooist could do a transfer job from this, but a tattoo artist would be able to capture the essence of it and adapt the design to the location. Last edited by AGuyNamedMike; 07-06-06 at 04:17 PM. I think you should change it to Brian Peppers Lonely Hearts Club Band. Just a suggestion.